Acanthocytes with target cells in a patient with advanced liver disease. Spur cells are characterized by diminished deformability, which is responsible for their entrapment and destruction in the spleen. For patient education information, see the Digestive Disorders Center and the Cholesterol Center, as well as Cirrhosis, High Cholesterol, Cholesterol FAQs, and Lipitor (Atorvastatin). The red blood cell membrane is composed of a lipid bilayer and proteins assembled in a complex manner that protects the red blood cell’s integrity and allows a bidirectional flux of electrolytes, energy, and information between the cell and its environment. To preserve the red blood cell’s shape and regulate the cell’s deformability and mechanical stability, the plasma membrane is tethered to a filamentous network of proteins known as the membrane skeleton. The lipid bilayer contains nearly equal quantities (molar ratio 0.9-1) of unesterified cholesterol and phospholipids that are asymmetrically distributed between the outer and inner leaflets. Phosphatidylcholine (30% of phospholipids) and sphingomyelin (30%) are found mainly in the outer layer, whereas phosphatidylethanolamine (28%) and phosphatidylserine (14%) reside in the inner layer. Although the cholesterol contents of the membrane are in equilibrium with the plasmafree cholesterol, the uneven distribution of phospholipids is maintained by passive and active processes. Acquired acanthocytosis is associated with advanced liver disease regardless of the primary cause. Although alcohol abuse is the most common cause of chronic liver disease in Western societies, other entities have been recognized, including nonalcoholic steatohepatitis (NASH) that may progress to cirrhosis. Anorexia nervosa, hypothyroidism, and myelodysplasia are rare causes of this disorder. Neuroacanthocytosis is the term used for acanthocytosis associated with inherited disorders. Autosomal-recessive disorders, abetalipoproteinemia/aprebetalipoproteinemia (chromosome 2), chorea-acanthocytosis syndrome (band 9q21), and the X-linked McLeod phenotype are among the conditions linked with neuroacanthocytosis. Most acanthocytic disorders are associated with acquired abnormalities of the outer leaflet of the lipid bilayer. However, some rare conditions have normal lipids and abnormal membrane proteins. A decrease occurs in polyunsaturated versus saturated and monounsaturated fatty acid content in red blood cells of patients with cirrhosis. 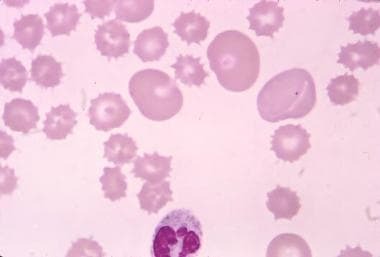 This abnormality is more pronounced in patients with spur cell anemia, resulting in the alteration of the red blood cell shape and a decrease of the cell’s fluidity. The plasma of some patients exhibits decreased activity of lecithin cholesterol acyltransferase, resulting in increased free cholesterol in the outer layer of the red blood cell membrane as a direct consequence of its increased concentration in the plasma. After acquiring these abnormalities in the plasma, the red blood cells undergo a remodeling process in the spleen, which gives them the spheroidal shape with longer and more irregular projections. In abetalipoproteinemia, B-apoprotein–containing lipoproteins (chylomicrons, very low-density lipoproteins [VLDL], low-density lipoproteins [LDL]) are nearly absent in the plasma. Plasma cholesterol and phospholipids are decreased, with a relative increase of sphingomyelin at the expanse of lecithin. At equilibrium, the sphingomyelin concentration in the outer leaflet increases, resulting in its expansion and acanthocytosis. Focal membrane skeleton heterogeneity has been described as characterized by decreased compactness of the filamentous meshwork in the areas underlying the spikes. This focal weakness allows limited detachment of the lipid bilayer that does not result in membrane loss. The nature of the membrane skeleton abnormality is not known. Five percent of all patients with severe hepatocellular disease develop spur cell anemia. Abetalipoproteinemia is an uncommon disorder. Chorea-acanthocytosis syndrome and McLeod phenotypes are rare; only a few dozen cases have been published in the literature. Acanthocytosis in abetalipoproteinemia is an autosomal-recessive disease that manifests in the first months of life. Neurologic symptoms appear in patients aged 5-10 years and may progress to death in the second or third decade of life. In chorea-acanthocytosis syndrome, the median age at onset of symptoms is 32 years. The prognosis of spur cell hemolytic anemia in advanced liver disease is poor, because, frequently, the condition precedes death by a few weeks to months. Most patients die of gastrointestinal bleeding, hepatic encephalopathy, or sepsis. Patients with abetalipoproteinemia develop functional deterioration early in life and do not survive beyond the third decade. Chorea-acanthocytosis syndrome is an irreversible entity with a slow, unrelenting progression of symptoms to death over 8-14 years. Doll DC, Doll NJ. Spur cell anemia. South Med J. 1982 Oct. 75(10):1205-10. [Medline]. Haruta I, Hashimoto E, Kabutake A, et al. Spur cell anemia associated with a cirrhotic non-alcoholic steatohepatitis patient. Hepatol Res. 2007 Jun. 37(6):482-5. [Medline]. Alexopoulou A, Vasilieva L, Kanellopoulou T, Pouriki S, Soultati A, Dourakis SP. Presence of spur cells as a highly predictive factor of mortality in patients with cirrhosis. J Gastroenterol Hepatol. 2014 Apr. 29 (4):830-4. [Medline]. Shohet SB, Ness PM. Hemolytic anemias. Failure of the red cell membrane. Med Clin North Am. 1976 Sep. 60(5):913-32. [Medline]. Cooper RA. Hemolytic syndromes and red cell membrane abnormalities in liver disease. Semin Hematol. 1980 Apr. 17(2):103-12. [Medline]. Cynamon HA, Isenberg JN, Gustavson LP, Gourley WK. Erythrocyte lipid alterations in pediatric cholestatic liver disease: spur cell anemia of infancy. J Pediatr Gastroenterol Nutr. 1985 Aug. 4(4):542-9. [Medline]. Olivieri O, Guarini P, Negri M, et al. Increased proteolytic activity of erythrocyte membrane in spur cell anaemia. Br J Haematol. 1988 Dec. 70(4):483-9. [Medline]. Arienti G, Carlini E, Scionti L, Puxeddu E, Brunetti P. Liver alcoholic cirrhosis and spur-cell (acanthocytic) anaemia. A study of erythrocyte ghost composition and fluidity. Scand J Gastroenterol. 1995 Dec. 30(12):1204-9. [Medline]. Kok VC, Lee CK, Horng JT, Lin CC, Sung FC. Reappraisal of the etiology of extracorpuscular non-autoimmune acquired hemolytic anemia in 2657 hospitalized patients with non-neoplastic disease. Clin Med Insights Pathol. 2014. 7:11-4. [Medline]. Marks PW. Hematologic manifestations of liver disease. Semin Hematol. 2013 Jul. 50(3):216-21. [Medline]. Wong P. A basis of the acanthocytosis in inherited and acquired disorders. Med Hypotheses. 2004. 62(6):966-9. [Medline]. Redman CM, Russo D, Lee S. Kell, Kx and the McLeod syndrome. Baillieres Best Pract Res Clin Haematol. 1999 Dec. 12(4):621-35. [Medline]. Terada N, Fujii Y, Ueda H, et al. Ultrastructural changes of erythrocyte membrane skeletons in chorea-acanthocytosis and McLeod syndrome revealed by the quick-freezing and deep-etching method. Acta Haematol. 1999 Mar. 101(1):25-31. [Medline]. Chitale AA, Sterling RK, Post AB, et al. Resolution of spur cell anemia with liver transplantation: a case report and review of the literature. Transplantation. 1998 Apr 15. 65(7):993-5. [Medline].